How do brands add to the Collaborative Economy, if they don’t offer physical goods? They sponsor the sharing movement. Meet Citi Bike in NY. 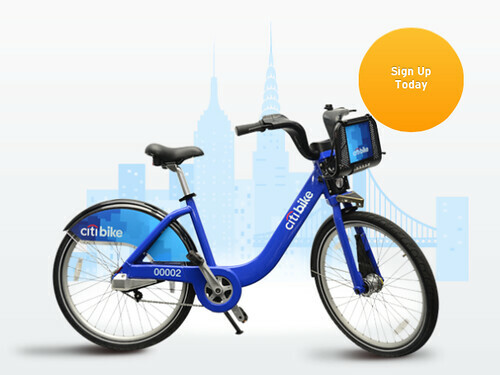 I’ve learned from my New York-based colleague, Rebecca Lieb (Marketing and Advertising analyst), that CitiGroup, one of the world’s largest brands, is sponsoring the country’s largest bike sharing program in our most populated city. That’s right, the sustainability trend for bike access to New York citizens and visitors is rolling out in the next few days, with prominent sponsorship and funding from Citibank. This program models after the Barclays Card sponsorship of bike-sharing in London, a trend that is starting to sweep across cities around the globe. Cleverly dubbed a “Citi Bike,” CitiBank will offer 6,000 of these blue unisex bikes and 330 docking stations in Manhattan and Brooklyn, with a vision to grow to more than 10,000 bikes. These all become mobile advertising units, travelling the streets of the financial center of the world. The data derived from these bikes and their digital check-ins, along with web and mobile features, will provide the CitiBank system with rich data at a local level. Digital marketers should be drooling. There are a number of brands that are jumping into the Collaborative Economy space (see index), either by converting their products to a service, fostering a community of reselling around them, or by sponsoring. Altimeter will be publishing a report on the Collaborative Economy next week in conjunction with my keynote speech at LeWeb. The Collaborative Economy isn’t just about saving the world through sustainable consumer practices. It’s also about the brands and corporations who want to be associated with it. The bottom line: Branding and sponsorship are just the start. Expect to see new models emerge, even for financial services companies.